Building a work wardrobe is one of the most requested topics here on INTO MIND, so I will probably write a few more posts with sample wardrobes, etc. in the future, but for today I just want to get into the 3 basic strategies I recommend you use to build a business wardrobe, depending on the type of company you work for: a bigger corporation, a start-up or anywhere with a smart-casual dress code, or yourself (as a student, freelancer or small-business owner). I'll cover each of these scenarios separately because they all require relatively different approaches in my opinion. it should not only make you look but also feel professional and give you confidence for presentations, meetings or talks with the boss. it should be 100% comfortable and functional, so you can concentrate on your work without having to worry about straps that dig in or a skirt that rides up. it should respect the company’s culture but still reflect your own personal style. Regardless of your own personal style, if you work in an environment with a very strict, professional dress code I recommend you build a completely separate work wardrobe. A ‘dual wardrobe’ model like that is not only way easier to plan, it also means you can fully express your personal style in your free time and won’t end up with a whole lot of stuff that’s work-appropriate but only 50% your style. If 'corporate dress code' equals 'drab and boring' in your mind, you might need to add a few new sources of inspiration to your list. As a first step, check out the other people in your office. What are they wearing, how do they interpret the dress code and which details could you incorporate into your own look? If there aren’t any stylish people in your office, expand your net! My favourite source for office style inspiration are TV shows, where characters are usually dressed in a way that’s super chic but still realistic and therefore replicable. My top three business style role models: Rachel Zane from Suits, Claire Underwood from House of Cards and Nessa Stein from The Honourable Woman. Once you have an overall idea of the kind of look you want to be able to create using your work wardrobe, focus on finding a few versatile, high-quality key pieces that could work as the framework of your wardrobe. 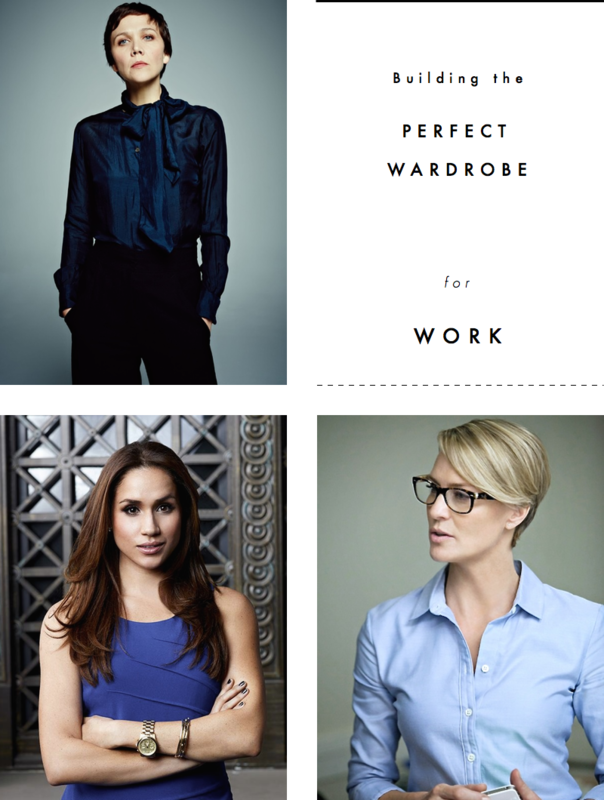 Think tailored pants, (pencil) skirts, a couple of blazers and a few comfortable (!) pairs of shoes. Since your options are somewhat limited here in regard to the type of pieces you can choose, make it a point to get the details right: fit, material and colour. Instead of any old black blazer, aim to find one that fits your silhouette perfectly, consists of a high-quality fabric and complements your shape. For more pointers on how to find high-quality garments, click here. Next, find a range of tops in different styles (shirts, knit sweaters, cardigans) that you can mix and match with your key pieces. This selection, your key pieces and tops, is your basic capsule wardrobe that you can then spruce up using accessories and single pieces, and that you’ll want to put the majority of your budget and your effort into. If chosen right, 20 pieces could be all you need (e.g. 3 blazers, 3 pairs of pants, 3 skirts, 8 tops, 3 pairs of shoes). Accessories, single items and smaller styling tweaks are the best ways to inject some personality into your office look, without breaking the company’s dress code. Go back to your favourite sources of work style inspiration and then make a list of everything that could add some colour or depth to your outfits like a few pieces of delicate jewellery, a statement necklace, a belt, glasses, a nice watch, nail polish or a brighter top worn underneath a more neutral top for a pop of colour. If you work in an environment without a dress code in the traditional sense, you obviously have a lot more freedom when it comes to your work attire. On the other hand, even when there isn’t an official dress code, most companies will still have a handful of unspoken rules, a few guidelines that everyone sticks to. And these can be quite tricky to figure out as a newbie. So, after your interview or on your first day, take a good look around to see what other people are wearing. Is there literally no dress code at all and people walk around in flip flops and band t-shirts? Or does everyone seem to stick to the general smart-casual look? Smart-casual essentially means no suits required, but you’ll still want to look polished and avoid some basic office no-goes (strapless tops or dresses, halter tops or dresses, super low-cut tops, short shorts, flip flops!). Section 1: Doubly-duty pieces you can wear for work AND your personal life Section 2: Free-time pieces that you can’t wear for work, i.e. only on weekends and evenings Section 3: More formal ‘add-on’ pieces that you specifically buy for the job to pair with your pieces from section 1. To set up your structure, go through your wardrobe piece-by-piece and pick out everything that you could wear to work. This will likely include any basic tops, shirts, nice jeans, tailored pants, skirts. Those pieces are your double-duty pieces that you can wear for both evenings and weekends with the rest of your wardrobe and on their own or with some more formal key pieces for work. Once you have identified your double-duty pieces you need to analyse that pile and figure out what you might still need to buy to a) fill any gaps and b) add a few smarter options to your set. Always think in terms of the bigger groups: bottoms (pants, skirts, dresses), shoes, jackets and tops. If your style is already relatively similar to 'smart-casual' you might need nothing but perhaps another smart blazer, some brogues and a couple of nice shirts. Extra tip: Even if the general dress code at your company is smart-casual, it’s a good idea to have at least one or two traditionally corporate/professional outfits at hand for special events like a meeting with an important investor, conferences, etc. One blazer, a matching pair of tailored pants or a skirt, some nice shoes and one or two dressier shirts for example. Once you have curated all of your more formal key pieces, go back over everything and write down a few sample outfits for work, to streamline and de-stress your morning routine. If you haven’t done so already I also recommend you reorganise your closet a little to reflect your new three-fold system. Yes, you can pretty much wear whatever all day long and hold client calls with your PJs still on, that’s your total right as a freelancer or student. But just because no one sees you doesn’t mean your 'work wardrobe’ isn’t important. If you go back up to the three criteria a good work wardrobe should fulfil, two of the three also apply to you: You want your clothes to make you feel confident and professional and you need them to be comfortable and functional. On top of that you also want your clothes to put you in the right mindset for work. For me, getting to work is always a lot easier when I do what most people who have to commute to an office do: Get up at a certain time, shower, get ready, get dressed and sit at a desk that I use solely for work. Rituals like that are important because overtime they essentially reprogram your brain to go into work mode once you have done X, Y, Z. As a freelancer you need to create those rituals yourself and your clothes are a crucial part of that. Your ‘work-from-home’ clothes don’t have to be fancy, but they should make you feel polished and put-together. Think comfy, but nice t-shirts, long-line cardigans, comfortable pants, loose-fitting shirts, etc. I also like to put on a little bit of make up and some jewellery in the morning, just so I can quickly get out of the door to run errands or meet people in the evenings, hold Skype calls, and so on. Even if you work from home, you will likely have to leave the house from time to time for client meetings and work-related events, so make sure you have a few dressier outfits sitting in your closet for those occasions. Have a look through your calendar to get a feeling for how often you need a more professional look per month and then build up a small set of pieces that you can mix and match, perhaps a simple blazer, some heels and a couple of shirts. What do you wear for work and how happy are you with your current work wardrobe? Do you have any tips for people who are just starting their first job in terms of what to buy first, etc?